Matt Shively is currently starring in the new ABC comedy, The Real O’Neals, alongside Martha Plimpton, Jay R. Ferguson and Noah Galvin. The series chronicles the lives of a close-knit Chicago family with Catholic roots whose bond is strengthened when the youngest son tells his parents that he’s gay. Other television appearances include True Jackson, VP (as Ryan Laserbeam), The Troop, Last Man Standing, Never Fade Away, Teen Wolf, C.S.I., How to Build a Better Boy (Disney original movie), Jessie and Resident Advisors. Shively played Ben in Paranormal Activity 4 directed by Henry Joost and Ariel Schuman and Zack in his first R-rated comedy, Feels So Good. Melissa Parker (Smashing Interviews Magazine): Matt, what did you think of The Real O’Neals when you read the script, and what did you like about the character of Jimmy? Matt Shively: I loved the script when I read it. It’s very much a family sitcom, but it has a lot more depth to it than a lot of regular sitcoms. The one thing that drew me the most to my character was the fact that he’s a jock. Many times TV will show a jock as a bully, but in this case, it’s the complete opposite. He’s a very supportive, loving, caring character, and I thought that was a very cool take on the guy that’s a jock. Melissa Parker (Smashing Interviews Magazine): You are 25, and your character, Jimmy O’Neal, is 17 years old. Were you worried that you couldn’t be believable playing a teenager? Matt Shively: You know, fortunately and unfortunately for my life, I’ve actually been playing 16 or 17 years old in almost everything that I’ve done, so it really wasn’t too big of a stretch. I’ve lived as a 17-year-old for the last 8 years. The funniest part was, right before we started filming after the pilot, I did a movie and had a full beard. I was playing 27, so it was a very weird thing to literally go from one day of playing 27 to the next day playing 17. Melissa Parker (Smashing Interviews Magazine): Do you think it’s the baby face? Matt Shively: I think it’s the baby face, and I’m going to stick with it as long as possible. I think I’ll be 40 years old and still playing 17 (laughs). Melissa Parker (Smashing Interviews Magazine): Jimmy’s brother, Kenny O’Neal, has come out to everyone as gay. What makes The Real O’Neals different from Modern Family or the now-defunct The McCarthys that featured homosexual characters? Matt Shively: I think the big difference is that The McCarthys and Modern Family both have older gay characters. This is the first network show that focuses on a 16-year-old gay character. It’s about the struggle of coming out and feeling comfortable in your own skin, and the biggest problem for our youth is not being able to do that because they’re afraid of what their families are going to think and what the kids in their school will think. The biggest thing for our show is that it shows what being that age and trying to become comfortable in your own skin really is. That’s the biggest difference. One of the biggest responses we get and the thing that makes me the happiest is that after an episode, somebody says, “I love your show and because of it, I just came out to my parents.” I think that’s what we’re really trying to do. Melissa Parker (Smashing Interviews Magazine): Have you or the cast received negative reactions also? Matt Shively: Noah (Galvin) has had to deal with a little bit of backlash, and that’s because, for as many homosexual people in the world, there are just as many homophobic people. The oddest thing is that people always get upset about certain shows and have a lot to say about it. But my biggest thing is, if you don’t like a show and don’t like the topic, then don’t watch it. My character is anorexic. There’s really nothing funny about that, but I was raised on the belief that if you don’t laugh, you cry, so you have to try and find light in every situation. You try to touch on every topic that teenagers have to go through and bring light to it so that people can see it from a brighter side rather than seeing only the negative of the situation. But since the first episode aired, it hasn’t been too bad. It was mainly before it aired that the people were saying a lot of the bad things. Once it aired, people realized it wasn’t a show based strictly on specific things. It was more of an “all about the family” thing. Melissa Parker (Smashing Interviews Magazine): Was there an immediate chemistry between the cast members? Matt Shively: Funnily enough, usually when you’re doing a show like this, they’ll have the chemistry reads before they cast everybody. But they ended up not having a lot of time before we had to start filming, so they ended up hiring all of us and hoping that we’d get along. I think what really makes the show great is our chemistry and the way all of us act with each other. The funny thing is that we’re much more of a dysfunctional family on screen than we are in real life. I’d never really spent time with a cast off screen, but we film, and then all of us would go out together. On weekends, we’d go to the beach. Everybody loves each other and is so supportive of each other. We’re very fortunate. Melissa Parker (Smashing Interviews Magazine): Do you think the show will be renewed for a second season? Matt Shively: We’ve actually been holding really steady in the ratings. I know that we’re waiting for the new pilots to come out to see whether they like anything more than our show. But I think the one thing we have that’s helping us is the fact that our show has a topic that the world needs right now, especially the youth of today. One of the biggest things that’s going to help us get further, if not the ratings themselves, is the fact that we’re sending a very good message and actually helping a lot of people. Melissa Parker (Smashing Interviews Magazine): What can you say about the season finale airing on May 24? Matt Shively: I looked at season one, but really didn’t realize it until the season finale, that it’s very much one long movie. The focus is very much on Kenny and his struggles of being comfortable in his own skin, getting a life and finally being himself. The finale is a very big episode. The one thing I loved when it ends is that, even if we don’t come back for a second season, there is a very big resolution. There are a lot of problems solved, and it is a good ending. I think that fans in the audience will get what they’re looking for. Melissa Parker (Smashing Interviews Magazine): When did you first realize that you wanted to be an actor, Matt? Matt Shively: I did a play in 4th grade. The adrenalin it gave me getting on stage and knowing that all eyes were on me and knowing I was there to entertain really was the spark. My mother wouldn’t allow me to do it because she was afraid of the rejection, which at such a young age, I completely agree. I don’t think any kid should have to face being told “No” three or four times a week. But she finally allowed me to do it because I started watching Even Stevens in 7th grade starring Shia LaBeouf. I watched that and wanted to make people feel the the way these actors made me feel. I love entertaining people. I love making people laugh or cry and draw their emotions into whatever world I’m in with me. Melissa Parker (Smashing Interviews Magazine): Was your first big break True Jackson, VP? Matt Shively: I would say so. I did a very small thing before that, but that was the first time I had a specific job where it was an every week kind of thing. So, yeah, that was definitely the big break for me. Melissa Parker (Smashing Interviews Magazine): It’s a shame your character was killed off in Paranormal Activity 4. Matt Shively: (laughs) The boyfriend always dies. I saw it coming the second I was cast, but I thought, “This will be fun! Melissa Parker (Smashing Interviews Magazine): Are horror films a favorite of yours to watch? Matt Shively: They were growing up. I was a huge fan of the horror genre. The scream films are some of my favorites. I love Nightmare on Elm Street and Halloween. It’s terrible because I’d watch them and have nightmares and not be able to sleep for weeks. Maybe that’s what drew me to them for some strange reason. But I just love that genre. I’m more into comedy now. But growing up at about the age of 8, I was super into the horror genre. Melissa Parker (Smashing Interviews Magazine): Tell me about Summer of 8. Matt Shively: Summer of 8 is a little indie film I did with a cast of people like Rachel DiPillo, Bailey Noble and Shelley Hennig, who all have good careers coming to them. That was the greatest experience I’ve ever had because we all lived in a house together for the two weeks that we shot this movie, and it was just a really beautiful thing. This is very much a coming of age story of all these friends on their last day before they have to head to college or go their separate ways. I also did a role in the new Power Rangers movie which comes out in March of next year. That was a really cool experience. Melissa Parker (Smashing Interviews Magazine): Do you enjoy making films more than being settled into an every day routine of a TV show? Matt Shively: I used to say I enjoyed films more just because when you’re doing it, it’s different. After a couple of weeks of doing TV episodes, it all starts to blend together. You can’t do a lot with your character. Once you have a set character, that’s what you do. But the thing with The Real O’Neals that’s amazing is that every week is different. Every week I have another new problem or a new kind of funny gimmick, so that’s really cool. I do love films because I love to be able to portray a character for two months and then move on to the next. As an actor, you love to do different things, so that’s always been fun. Because of the cast, crew and stories of The Real O’Neals, I’m a big TV guy. Melissa Parker (Smashing Interviews Magazine): Any time left for a social life? 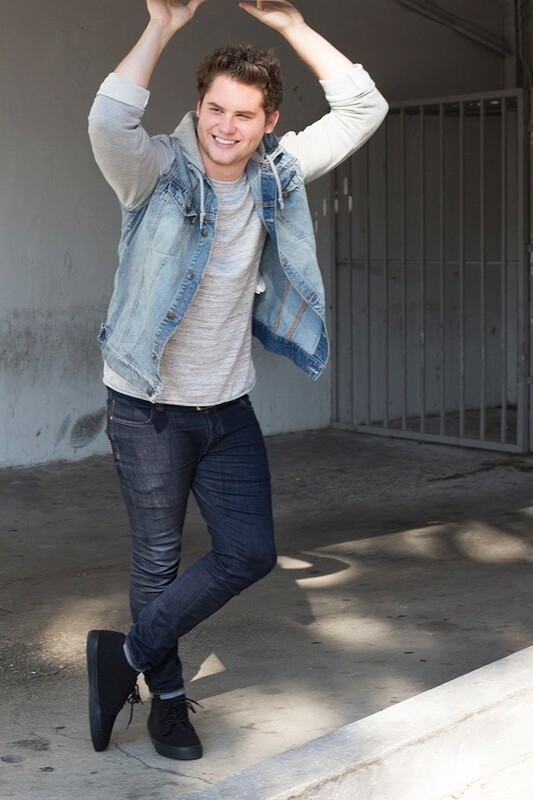 Matt Shively: I just got a dog a few weeks ago, so I’ve been playing dad recently, going to the dog park and stuff. To be honest with you, I actually hang out a lot with Noah and everybody from the show. We have movie nights and watch films. We have days where we go to Disneyland and the beach. We all just kind of hang out. Other than that, I like my night life. I go to bars, meet new people and hang out with my friends. You know, the regular 25-year-old thing. « Lita Ford Interview: "Everybody and Their Mother Has Asked Me About a Reunion. Let’s Get Past the Runaways"